Last week, politics was the overriding theme in the blogosphere. Several controversies-including the growth of anti-poverty programs, what liberals think of conservatives and the nature of President Obama’s opposition-stirred up divisive online conversation. Heated commentary and even inflammatory accusations ensued from both sides of the political spectrum and often seemed to result in the ideological foes talking past each other. For the week of August 30-September 3, almost a third (32%) of the news links on blogs linked to a USA Today article reporting that one in six (and rising) Americans are on government assistance programs like Medicaid. That made it the week’s No. 1 subject in the blogosphere, according to the New Media Index from the Pew Research Center’s Project for Excellence in Journalism. The majority of bloggers who discussed the story saw it as a strong indication that the economy is in terrible shape and blamed President Obama for the growth of public dependence on government. A few bloggers, however, saw it as an indictment of the private sector and called for more attention to the challenges of assisting those in need. Despite the mainstream press’ continued focus on the economy, the subject had not been of great interest to bloggers. Last week was the first time since June 14-18 that an economy-related topic led the blogs. That week, the focus was on Obama’s request for $50 billion in emergency aid to state and local governments. Indeed, last week marked just the fourth time in 2010 that an economy-focused subject was among the top three stories in the blogosphere. Two of the other top stories last week were pure politics-and heated politics at that. The No. 3 subject, at 13%, was a column by Washington Post columnist Charles Krauthammer declaring that liberalism is under siege because liberal elites throw charges of bigotry against the majority of Americans who disagree with them. The fourth subject, at 11%, was the August 28 Tea Party rally in Washington D.C. led by talk show host Glenn Beck. The same topic was the fourth largest topic the previous week leading up to the event. These two subjects combined to trigger an angry debate about the opponents of Obama and the makeup of the Tea Party rallies. Conservatives argued that Obama and the Democrats are dismissive ideologues, ignoring the desires of the country in order to push a radical agenda. Liberals countered that the Tea Parties are made up of ill-informed conservatives who are afraid of minorities. The other two stories that ranked among the top subjects on blogs last week had political components as well. The second-largest story, at 14%, was the September 1 hostage situation at the headquarters of the Discovery Channel outside of Washington, D.C. The culprit, James Lee, was killed during the incident although no bystanders were harmed. Much of the attention to this story was led by bloggers who labeled Lee an "eco-terrorist" and complained that the mainstream press was not accurately portraying his radical motives. The fifth story, at 6%, was a Los Angeles Times article suggesting that if a large anti-incumbent wave occurs in the upcoming November elections that favors Republicans, it might also mean that large numbers of women in Congress would be replaced by men. On the social networking site Twitter, the top two subjects were technology-related, which is often the case for a platform that is often used to both announce and evaluate new advances in social media and applications. The No. 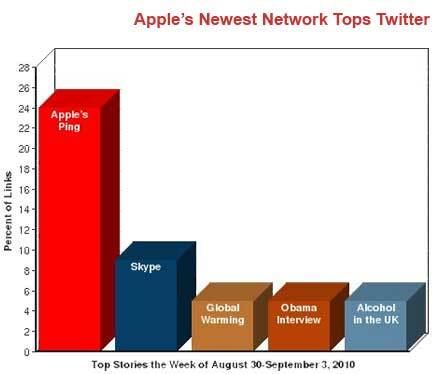 1 subject, with 24% of the news links from Tweets, involved Apple’s new social network for music called Ping. Available through iTunes, Ping will allow users to follow their friends and favorite artists. Both Mashable and the BBC declared that Ping will be a direct competitor to the well-known social networking site MySpace. The initial reaction on Twitter was mixed, however, as some users expressed optimism about the network’s potential while others thought the design had some fundamental flaws. "I really like the iTunes 10 hybrid list/album view. However, I don’t see myself actively ever using Ping," shared Jason Lake. The second topic, at 9%, was the newest product from Skype called Skype Connect which is aimed at making their phone calling technology more useable for businesses. The next three topics, however, were wide-ranging-involving climate change, the commander in chief and cultural habits. A Guardian report that Bjørn Lomborg, one of the world’s best known climate change skeptics, has reversed his position and now declares climate change to be one of the chief concerns facing the planet, was third at 5%. A story about President Obama’s interview with NBC’s Brian Williams where he discussed the Gulf oil spill, the recovery after Katrina, and the Glenn Beck rally, was fourth at 5%. That was followed (also at 5%) by a BBC story about a study showing that last year, alcohol consumption in the UK saw its sharpest year-to-year decline since 1948. Most of the bloggers who commented on the USA Today article claimed Obama and leading Democrats were responsible for the troubling trend. "President Obama has put the United States in the fast lane on the road to serfdom," declared Ari at Strictly Right. "The aforementioned ever expanding welfare programs create, promote, and maintain a culture of helplessness…Democrats do not care if they collapse the system from within, so long as they can maintain their ironclad grasp on power a little while longer." "Obama’s goal of turning the U.S. into a European-style quasi-Socialist welfare state going according to plan…" wrote Tyler Potts Politics. Other conservatives expressed concerns that this trend would be permanent. "By increasing the eligibility and benefits of these anti-poverty programs, the government is luring more people into long term dependency," argued Julie Borowski of Freedom Works. "A record number of people being dependent on government programs will be harmful to America’s future prosperity." "With this many people receiving taxpayer dollars, is there any possibility of real economic reform?" wondered Common Folks Using Common Sense. "Will there ever be any real possibility of shrinking the government now? Have we finally entered the financial Black Hole, with collapse/implosion as our only future?" While in the clear minority, a few liberal bloggers blamed other factors for the growth in these programs, with some shifting the blame from the public sector to the private sector. "That the private sector has failed should be obvious," suggested Charles Lemos at My DD. "I guess…libertarian[s]…would prefer that Americans line up for private charities and soup kitchens. This isn’t just the poor that we are talking about. Increasingly those accessing these social safety net programmes are those who formerly comprised the middle classes." "Sadly, I think the Republicans like it this way," posted Mary Shaw at the Philadelphia Freedom Blog. "Why else would they insist on blocking any legislation that could help alleviate this suffering, such as the small business bill, which would provide hiring incentives?" Charles Krauthammer’s August 27 column criticized liberals for characterizing their political opponents and the "great unwashed" as bigots on such hot topics as the proposed Islamic Center and Mosque being built several blocks from New York’s Ground Zero. The piece sparked a potent discussion online over the character of liberals and supporters of Obama. 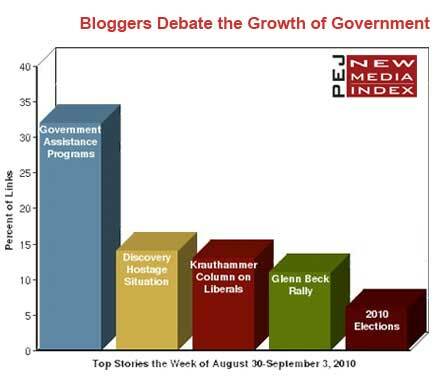 Many bloggers agreed with Krauthammer’s claims. "What he has to say about the methodology of the left, demonizing their opposition by associating them with charges of bigotry, racism, homophobia, and other such hate group associations, reveals the total moral bankruptcy of their agenda," wrote Right Minded Fellow. "Ad hominem attacks are the trademark of the Left Liberal," concurred Frederic L. Milliken at Lexington Libertarian. "But it seems to work better to just trash the messenger rather than the message where one would have to come up with a logical argument." Other conservatives connected the column to their expectations of a landslide victory in November that will defeat many Democrats in Congress. "I am a PROUD member of the great unwashed…and I can’t wait to wash the floor with these hypocritical elites in November!" announced Sharp Right Turn. "Thank God Almighty the comfortable masses are awakening in this midst of this daily nightmare." "They [liberals] are again resorting to labeling everyone, in the basest terms, as racist, ignorant, white trash et al…they richly deserve what is coming to them this November…tick, tick, tick…" predicted Navitor. A number of liberals reacted strongly against the piece. "When a liberal looks at the anti-mosque movement and describes it as bigoted, it’s because the liberal is looking clearly and plainly at what is obvious," declared Marc Valdez. "Bigotry has characterized almost the entire opposition to the mosque. I don’t think I’ve seen anything quite so bigoted since the police dogs were released on Selma’s Pettus Bridge in 1965!" "What about those racist posters seen at tea-party rallies and the questioning of whether the President is an American citizen? Racial profiling? Denying citizens the rights that others have by popular vote? Denying citizens religious freedom?" asked Blueollie. "Why any reputable newspaper prints Krauthammer’s garbage is beyond me; it is simply pathetic." A related conversation occurred following Glenn Beck’s August 28 Restoring Honor rally on the steps of the Lincoln Memorial. The event drew a lot of attention from supporters and detractors alike. "Glenn Beck’s, ‘Restoring Honor’ rally, a tremendous success," declared Scared Monkeys. "It was not about LEFT and RIGHT, ite was not about Republicans and Democrats … it was about God, Honor and Country! Today was a day to ‘Remember the Dream’ and to take back America and restore its honor." "Beck is just another in a seemingly endless line of far-right blowhards seeking to curry favor with the ignoramus brigades of the Religious Right by bashing the wall of separation between church and state," suggested Rob Boston at Opposing Views. "Beck is aiming to create a new enemy for the next decade: Anyone who dares to support church-state separation and its key partner, secular government." Following the rally, Beck gave an interview to Fox News in which he challenged Obama’s religious beliefs, saying, "People aren’t recognizing his [Obama’s] version of Christianity." That remark stirred up more criticism from liberals. "So now rightist luminaries like Glenn Beck have moved away from their dishonest marginalization of Barack Obama as a foreign-born Muslim to re-marginalizing Obama as the wrong kind of Christian," proclaimed James Rowen at The Political Environment. "This is dangerous, genuine demagoguery." "It’s fairly obvious what Beck and Palin are attempting. In marketing terms, they are repackaging the old, stale product of white resentment that lurks at the heart of the Beck’s popularity and Tea Party outrage," agreed Sam Fulwood at Blue Chip Black. "Having exhausted racist tactics, Beck and his Tea Party faithful seek mainstream acceptability by cloaking their politics of resentment in a religious shawl." Due to an apparent glitch on the YouTube site, the most viewed news videos last week were the exact same as the previous week. PEJ’s New Media Index is a companion to its weekly News Coverage Index. Blogs and other new media are an important part of creating today’s news information narrative and in shaping the way Americans interact with the news. The expansion of online blogs and other social media sites has allowed news-consumers and others outside the mainstream press to have more of a role in agenda setting, dissemination and interpretation. PEJ aims to find out what subjects in the national news the online sites focus on, and how that compared with the narrative in the traditional press. A prominent Web tracking site Icerocket, which monitors millions of blogs, uses the links to articles embedded on these sites as a proxy for determining what these subjects are. Using this tracking process as a base, PEJ staff compiles the lists of links weekday each day. They capture the top five linked-to stories on each list (25 stories each week), and reads, watches or listens to these posts and conducts a content analysis of their subject matter, just as it does for the mainstream press in its weekly News Coverage Index. It follows the same coding methodology as that of the NCI. Note: When the NMI was launched in January 2009, another web-tracking site Technorati was similarly monitoring blogs and social media. PEJ originally captured both Technorati’s and Icerocket’s daily aggregation. In recent months, though, this component of Technorati’s site has been down with no indication of when it might resume. The Project also tracks the most popular news videos on YouTube each week.